I much appreciate your regular fishing reports and the effort you put into it. However, for virtual fly fishing beginners such as myself, I believe that if you were to publish a background paper on Goulburn River water flows that beginners would get more from the reports. For example, the Goulburn River level @ 130 megalitres a day. What does this mean? (I assume that is the volume released via Eildon per day). Is there a statutory requirement to release a minimum flow? If there is what is it? What impact does the raising or lowering of water levels in the Goulburn have on hatches, likelihood of fish to take flies, differences in approach that fly fishers should take, and the like? I don’t believe that such background info need be provided on an ongoing basis but perhaps as a one-off intro to your reports for the new season. Please keep up the good work. I look forward to the resumption of your reports. Thanks for the email Bruce. I will attempt to answer your questions and shed some light on the management of the state’s most popular trout river. I hope this helps you to better understand how this river works. The Goulburn River is used to transport irrigation water from Lake Eildon, downstream to the Goulburn Valley fruit bowl, and beyond. While also used for town drinking water and recreation along its entire length, its primary purpose is the delivery of water for agriculture during the drier months between October and April of each year. In a nutshell, rain water is captured in Lake Eildon in the wetter months and then delivered downstream when it is most needed during our long, dry summers. This results in an unnatural situation of low/warmer flows in winter/spring, and high/cooler flows in summer. This is the exact opposite flow regime to streams nearby that run high and cold in winter and low and warm in summer. It’s what makes the Goulburn a terrific habitat for trout. The management of water releases from Lake Eildon to the Goulburn River is overseen by Goulburn Murray Water (GMW). Lake Eildon has over 500 kilometres of shoreline and when full, holds seven times the volume of water of Sydney Harbor. The dam wall, located at the township of Eildon, is at a natural choke point in the valley, and blocks the flows of several rivers, including the Jamieson, Big, Howqua, Delatite and Upper Goulburn. Water is taken from Lake Eildon via the main power station as opposed to the spillway itself. While the spillway is used at times of higher water levels (not since the late 1990’s), and to test it’s function and operation, these days water is nearly always released from the out-take tower, into the Pondage via the power station, where electricity is generated off the drop in height from the lake to the pondage. This water coming out of the power station doesn’t go directly into the river from the lake, but rather is held in two connected pondages (smaller lakes) immediately beneath Lake Eildon and adjacent to the town itself. The pondage, as these two interconnected lakes are collectively known, holds approximately 5,200 Megalitres. The reason that the water cannot go directly from the lake to the river, is because the out-take tower in the lake does not allow the precise regulation of the lower flows often required for the river. Therefore, the water is delivered from the lake to the pondage first, and then more precisely regulated when being released from the pndage gates to the river. The Pondage is drained and filled depending on demand for irrigation and power, and as such, the level is often changing. While the levels may seem hard to predict to the casual observer, there is a method to the madness. If the river is at high summer levels i.e. 5,000 + MLD, then the pondage will be filled and drained daily as it only holds 5,200 Megalitres and you will see dramatic fluctuations over the course of a day. On the other hand, if you arrive to a full pondage when the river is flowing at winter/spring levels i.e. 400 MLD day, then the pondage level is going to remain quite steady. Water is released from the Pondage into the Goulburn River via the pondage gates, and at times the small Power Station at this lower end of the pondage. This is not to be confused with the large power station that sits at the head of the pondage between Lake Eildon and the pondage. From this point secondary release point, the water can be regulated at precise levels, even down to the very lowest flow rates. The water level in the pondage is a bit of a contentious issue. Many locals prefer to see it at full capacity as this is the most visually appealing situation for the casual tourist. Others like it below 50% as this tends to draw the fisherman to try their luck. The power companies prefer a low level be maintained as often as possible as this gives them plenty of ‘airspace’ that they can use to maximise profits when price spikes occur. That is, the emptier the pondage is, the more electricity can be generated as they can drop more water into it and maximise their capacity for power generation. As with all flow regulated rivers, there are a host of requirements that water managers must conform to. The most obvious and most relevant to us as anglers is the minimum riparian flow or environmental flow as it is often referred to. Recently this mandatory minimum was raised to 130 ML/D to 400 ML/D. This was a big win for the trout and the fly fisherman who chase them. A win that will have positive long term effects on the fishery. This new height must be maintained in order to meet domestic and stock water requirements down stream. Until I started writing this and gave someone at GMW a copy to proof read, I was under the illusion that the environmental flow was to keep the river in a reasonable state for all organisms including fish and macro invertebrates. However this is not the case. It is about delivering basic water supplies to towns and farms downstream. Ouch. I thought we’d had a big win! This level of 400 MLD is set for most of May through to late September/October. This level restricts the success of trout spawning in the river with 1,200 MLD being close to the ideal level. But it’s much improved on the previous low levels mandated as the minimum. There has been a lot of talk of MLD or megalitres per day. As a unit of measurement a megalitre is a million litres or to give a visual representation, the amount of water contained in an Olympic sized swimming pool. As such 400 MLD is 400 million litres of water being released daily i.e. in a given 24 hour period 400 million litres will pass by any point on the river. While this sounds like a lot, it is the minimum flow allowed by law. Summer releases of 4000-6000 MLD are the norm and in years when the lake is full, releases of 8,000-12,000 MLD are common. The largest releases we have witnessed were around 40,000 MLD when Lake Eildon was full and there was nowhere to hold the excess rain water. * For those more astute with their numbers a Megalitre is 220,000 gallons or 1,000 kilolitres. While we know that water is held back in the lake during the wetter months of the year with a river level of 130MLD, what happens at other times of year, and how is the flow rate calculated at these times? To begin to answer this we must understand that there is a defined irrigation season. It starts on August 15 and end on May 15 each year. Water can be purchased by farmers down river for irrigation purposes. How much they can purchase is set by two things. Their licence and the annual allocation determined by the regulators (GMW). For example a farmer may have a 3MLD licence. This entitles him to phone GMW and ask for this to be released/purchased in coming day/days. This explains why you will see the river rise in level in the days preceding a hot, dry spell. Farmers are always watching the weather forecast and judging how much water they will need. Same goes if there is rain forecast, you will often see the river drop as the farmers know they are going to get the water they need for free. Simple really. Rain often equals dropping water level. A dry, hot spell equals higher water levels. Then comes the second determining factor in regards to licence’s and allocation. Those same farmers may not be able to get the full amount of water that they are ‘entitled’ to depending on the rainfall for that year and the predictions of what is to come. As the situation changes in the water storage levels, managers/regulators determine how much water there is and how much can be released. For example in a dry year the regulators may decide that everyone is only able to have half of their licence fulfilled. Therefore the 3MLD becomes a 1.5MLD entitlement. This is being rather kind for the sake of nice round numbers to work with. In my experience, in recent years (this was originally written at the tail end of the drought), I have found that this system has worked well, as the sheer nature of the drought has forced those in charge of managing our water supplies to err on the frugal side. They are much better at what they do as a result and the future looks rosier than it did ten years ago when they were quite wasteful. This is not necessarily a criticism of GMW as water appeared a plentiful and almost inexhaustible resource at the time. Suffice it to say that water management is the highest priority for all involved. As mentioned above, irrigation demand is not the sole reason for water releases from the lake into the river. Power generation plays a huge part in the overall scheme of things and is equally important in determining how much water is released. Just like the farmers, the power companies also have an entitlement that they can use. While they can often take advantage of water already being released for irrigation purposes, there are times when they will need more water than is being requested by the farmers. At these times they will use some of their own water entitlement. This often happens at odd times of year including in late winter, but particularly in the middle of summer heat waves. The relationship between power generation, irrigation supply and water releases is inextricably entwined. Both power generation and irrigation have a major effect on how much water is released. Undoubtedly the water levels play a major role in the quality of the fishing, but they are secondary in my opinion. Water temperature and dissolved oxygen levels are a much greater indication of the quality of fishing to be expected. Nonetheless an explanation of the water levels is necessary. These are flows of 1,000 MLD or less and usually 400-500MLD. This allows unlimited wading access to the entire river bed and means that there is a lot less water between fish. 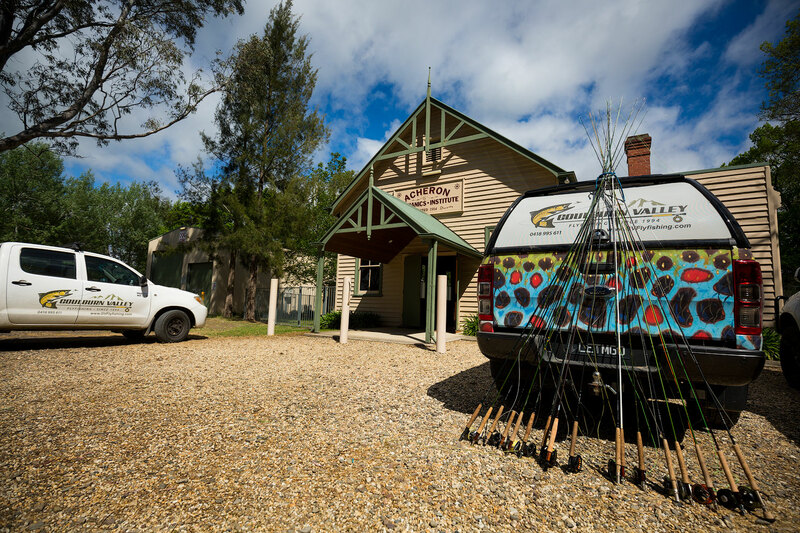 These lower levels are the favoured by the vast majority of anglers because it is the easiest time to fish the Goulburn, yet the fish can be shy. Typified by flows between 1000 and 2500 MLD. The traditional river structures of glide, riffle, pool etc are still visible and you might say that this is the best level. There is almost an endless amount of trout real estate, and in a perfect world, it is the height I would like to see the river running at 365 days of the year. Water levels in this bracket are among the best for all round fly fishing as well as insect hatches. As we get over 3000 – 6000 MLD, we start to see a gradual and then sudden disappearance of those stream structures mentioned earlier. This is frightening to many as the water appears to be surging past and void of any fish activity. While this is true to some extent, in that the fish will not be holding in the middle of the river and the hatches will be restricted, feeding fish will be found around the edges and in very close to the bank. Nonetheless, there is still plenty of softer water to be found, and the hatches and drift boat fishing is tremendous at these river heights. Once we get beyond 6000 ML/D and upwards, we begin to see a complete disappearance of anything resembling the typical trout stream structure. There are no gravel bars, runs, glides, riffles. It is simply a ceaseless mass of moving water. Flooded bays, lagoons and billabongs then become important features, but for the most part the river appears unfishable to those unfamiliar with it. The fishing in the Goulburn starts on opening weekend and improves slowly but consistently with each passing day. In the very first few days of October we get some huge hatches of duns and caddis and the next six weeks are alive with insect/fish activity due to an intersection of favourable water temperatures, dissolved oxygen levels and water levels/river height. By mid to late November increased water flows have an effect on some of the aquatic insects in that they will now mostly hatch on evening as opposed to daylight hours. This lack of hatching aquatic insects is more than offset by the appearance of terrestrials; with beetles, termites and willow grubs appearing en masse. The fish are in great condition by this time of the season and rise with great regularity, with plenty of protein rich food and perfect water temperatures in the offing. December is a great month, as the cicadas have appeared by late November and the grasshoppers and willow grubs are just beginning as well. By January we get huge flows down the river, and since the drought ended, we have seen a return of the halcyon days where the best fishing of the season is in January and February, with cold water of 10-11 degrees celsius, and releases of between 5000 – 9000 ML/D. January, barring any prolonged 40 degree stretches, is a wonderful time for stalking the edges with large terrestrials and willow grubs to large, sighted brown trout. February can be immensely good but it comes down to how many times some of the fish have been caught and how long the willow grubs last. Recent seasons have seen an explosion of the European Wasp population, and these cunning pests have worked out that the easiest food source in town, is the willow grub. We have seen complete populations of grubs wiped out in less than two weeks, once the dreaded wasps appear in force. March has been good in recent years with the latter half being of particular note. April sees a falling river level but more importantly, dropping air temperatures and a return of the aquatic insects. Water temps drop back to the mid teens due to the decreasing hours of daylight and the first of the overnight frosts. Temperatures actually fall away very quickly. Once again this coincides with lower flows so people mistakenly attribute the better fishing with the flow rate only. The quality of the fishing is however, much more dependent on water temperatures. As such, April through May fishes very well, albeit with a gradually decreasing quality. This is diametrically opposed to springtime, when everything is improving with every passing day. The most contentious of issues in regards to tailwater fisheries the world over, is the rapid change in river height. Either up or down. In other parts of the world where trout are valued, there are strict rules in place that determine how dramatically the water can be altered in any given period. Unfortunately, we fall well behind most other nations when it comes to this side of things. Nevertheless a brief explanation is necessary. A sudden dramatic shift in river height usually has a negative effect on the fishing. This is the general rule but there are many exceptions. I will run through some of the most important in a moment. First off lets just state the obvious, and that is that fish get comfortable in a routine. They are territorial and are very familiar with their immediate surroundings. As such over time, a fish finds shelter/cover nearby, finds feeding lies (places in the open where they sit when there is a lot of food in the drift) and maybe a prime lie (place where a feeding lie and shelter of some sort intersect). Then the river is raised or dropped dramatically and the fish must relocate and start the process again. While the fish still find food and continue to eat, it definitely throws them off their game as they all jockey for the same spots and have to up stumps and move house. This leads us to which is more challenging? A quick rise or a quick drop? Well here’s a politicians answer. It all depends. A quick rise at least has the benefit of not forcing the fish to fall back further or deeper into the river bed. While the hydrological aspects of the trout’s underwater world may be clearly altered, it is not forced to move or be left high and dry. They are going to have to move to find the best of the lies at the new river height, but it’s nothing more serious than that. Pretty obvious stuff. Also, fish are used to rising levels meaning an increase in the amount of food on offer. This is not a thought process, but something ingrained. Go to Tasmania in spring or fish our non dammed rivers in September/October when they break their banks. The fish come out foraging on the newly inundated land as quickly as the water rises. The reverse is also true. Somewhere deep in a trout’s DNA is the ‘survival gene’ that clearly equates dropping water levels to danger and time to move back to the main water courses. Moving on to dropping levels, we can now join the dots and say that this sort of movement in river flow has much more of a negative effect on the fish. They are physically forced to relocate, often along with the bulk of the trout population of the river. Massive, short sharp drops in height really knock the fish about and mean poorer fishing. Competition for prime lies and shelter becomes more of a problem at lower levels and the fish become very wary to any movement on the bank, and around them in general. So when does the reverse apply? When does a large drop in water level equate to better fishing and a significant rise in level result in worse fishing? From my experience this is how it goes. A big drop in river height on the Goulburn results in great fishing in autumn. After an extended period (several months) of high flows the hatch stops as the bugs sense that there is a flood, and the bulk of them just wait it out. This causes a bit of a local event. First of all, we generally see a dropping in water temperature as overnight air temperatures have more impact on the lower, slower flows. We also see more light reaching the river bed, which has an effect on insect hatches. But the most important factor is that the huge drop after such a long period results in mass migration of sub-aquatic critters, that must move or die. Many of these insects get swept away by the current, and washed down river, only to end up as trout food. The fish are aware of this sudden opportunity, not through memory but simple observation, as the water is practically alive with insects when these rare events occur. We are talking about April/May here and the series of significant drops that the river makes as the summer flows are scaled back to the minimum flows of winter. What about a sudden rise resulting in poorer fishing? This occurs in early summer when water temperatures are increasing and slowing aquatic insect hatches. Sudden dramatic increases in water levels, severely impact the hatches. The water often drops in temperature by 2-3 degrees. Which is a huge factor. But I believe it also has a lot to do with light intensity on the bottom of the river and something to do with water pressure. Even though it may be small when compared with deep ocean waters and the extremes encountered there, I strongly believe that this is a major factor and that it is significant for the tiny bugs living on the bottom of freshwater streams. So when is the best time to come up for a fish? Well like my ex-business partner Geoff still says, it’s whenever you get the time! I used to hear him say that over and over to people on the phone and I would just cringe and dismiss it out of hand. But as I am spending more time fishing in different places for different species, I am coming to realise that he is dead right. Some of the best bass fishing I have had has been on a crashing barometer despite the rules. The best bream fishing I had a few weeks ago was on the bottom half of a falling tide. The rules are just guidelines; not laws that are set in stone. To further illustrate this point I should briefly describe my recent winter vacations. Each June/July I am spending about six weeks fishing on the mid north coast of NSW chasing bream before heading to Montana with our groups. I pretty much fish all day, every day. As the days are short at this time of year, if you wait for the perfect tide you won’t be fishing much and the big tides are all night tides anyway. While I did have some stellar sessions on the typical half run in to top of the tide, all stages worked well on most occasions, with my best two sessions occurring on low tides. This is not how the books describe it! Trout fishing is much the same. Living here on the river since the summer of 96-97 and being able to walk out my back gate at any time of day, any day of the week, I have fished in all conditions at all river heights. I have had equally brilliant sessions in sunny, cloudy and rainy weather. Found brilliant fishing on low and high barometers and dropping and rising ones as well. Same goes for river heights, air temperatures, lightning storms. The more I fish, the more I realise that it’s about time spent on the water and reading/interpreting what is going on. If we here at GVFFC only went fishing when the conditions were ‘perfect’, we would be doing a hell of a lot of gardening and our diaries would show only a fraction of the fish captures each season. I hope that this has helped you to make some sense of the river and how it is managed in terms of water releases, and how we approach the differing river heights. If you wish to read an overview of a fishing season on the Goulburn, please click here. Please use the photo below to get an idea of the differing river heights. Photos were taken off Gilmore’s Bridge located between Alexandra and Thornton, looking downstream from the bridge. Clicking on the image will give you a larger version that is formatted width wise to fit on an A4 but it will use three sheets as there a number of pics to compare.